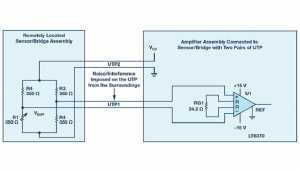 The instrumentation amplifier (IA) is the workhorse of sensing applications. 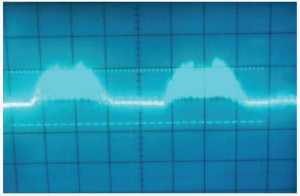 In this article, will explore some ways to take advantage of these amplifiers’ balance and excellent dc/low frequency common-mode rejection (CMR) for use with resistive transducers (for example, strain gage) when the sensor is physically separated from the amplifier. will present methods to increase the noise immunity of such gain stages while making them less sensitive to supply variation and component drift. Measured performance values and results will also be presented to show the accuracy range in order to allow a quick evaluation for end-user applications. When it comes to sensors, there is little competition for what a Wheatstone bridge (Figure 1) can do. 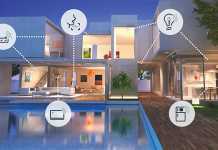 The bridge can produce a differential voltage that predictably changes in response to changes in a physical parameter with the side benefit of providing temperature and time drift immunity. 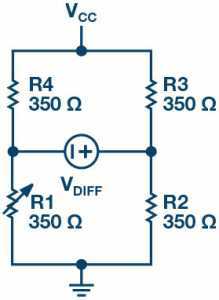 The differential voltage rides atop a large common-mode (CM) voltage. 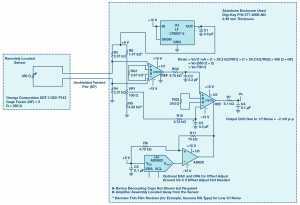 To amplify the small signal from a bridge, an instrumentation amplifier is used. The beauty of an IA is that, with little or no loading of the bridge elements, it can sense the differential voltage and reject the CM to a degree that is next to impossible to achieve by a traditional op amp, due to the high degree of external resistor matching required. station or within the structure of a bridge, is unlikely to be located next to the electronics used to read the measurement. For example, when dealing with a two-wire quarter-bridge strain gage such as Omega corporation’s SGT-1/350-TY43, placing the sensor remotely from the sensing amplifier, as shown in Figure 2, yields unsatisfactory results, even if shielded twisted pair sensor leads are used. 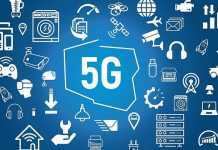 One solution for the successful extraction of the small bridge differential voltage from the CM (dc and interference) is to use two pairs of shielded or unshielded twisted pair (UTP). Done this way, both IA inputs are balanced and subjected to the same CM noise pickup. This is shown in Figure 4. A device such as the 16370, with excellent low frequency CMR (120 dB) can reliably go to work on rejecting what afflicts both IA inputs. The result is a clean output waveform at a large distance, even in noisy environments. 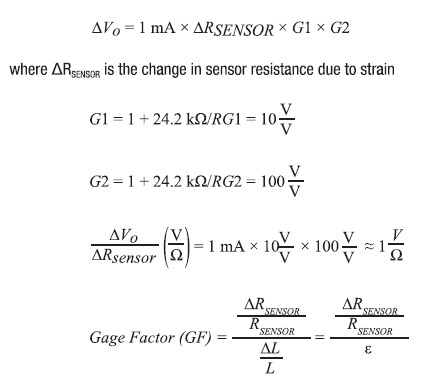 For the component values shown in Figure 5, there will be about 1 mA flowing through the sensor Reensog- With U1’s RG1 value, that stage runs at G = 10 V/V and provides a 10x replica of the voltage across Reensog at its output voltage, about 3.5 V. U1’s main task is to eliminate the interference present on the UTP long length of wire and responding only to the sensor voltage which is the sensor resistance times the ~1 mA current flowing through it. LT6370’s excellent low offset voltage and drift along with its exceptional CMR make it the obvious choice. The other half of the Wheatstone bridge is comprised of R5, R6, and VR1 with near identical current flow as the sensor half of the bridge. Both the sensor voltage at U1 output and the reference voltage at VR1 wiper reach the differential inputs of U2 after some low-pass filtering to eliminate unwanted noise. U2 is set for high gain (G = 1 + 24.2 kKO/RG2 = 100 V/V) to magnify the very small sensor voltage on its positive input compared against the fixed, low noise reference voltage, derived from the LT6657-5 voltage reference, on its negative input. 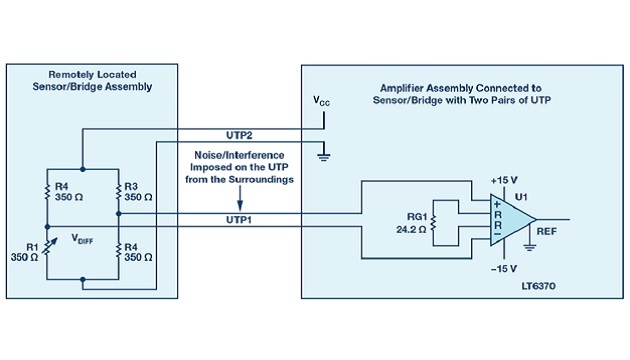 U1 output accurately represents the measured strain applied to the sensor, attached to the element or material of interest, to drive an ADC or other similar signal processing. The optional DAC and OPA (U4, U5) tied to U2’s REF pin (which can be grounded if no offset adjust is needed) can be used to provide output offset adjustment and zeroing. By using the DAC, it is possible to shift the U2 output voltage to a desired pedestal or CM level suitable for the selected ADC. For example, an ADC with a reference voltage of 5 V can be driven directly from U2 with its zero output set to 2.5 V using the DAC driving Analog Dialogue 52-12 December 2018 U2 REF input. 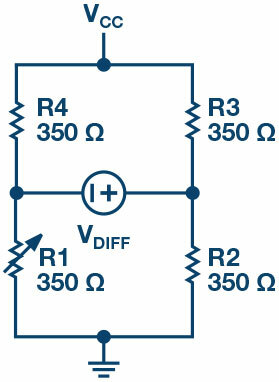 Done this way, 0 V to 2.5 V ADC analog input represents compression and 2.5 V to 5 V signal represents tension strain. It is import- ant to note that the device driving U2 REF pin, AD820 in this case, should maintain a low impedance to eliminate any possible gain errors. 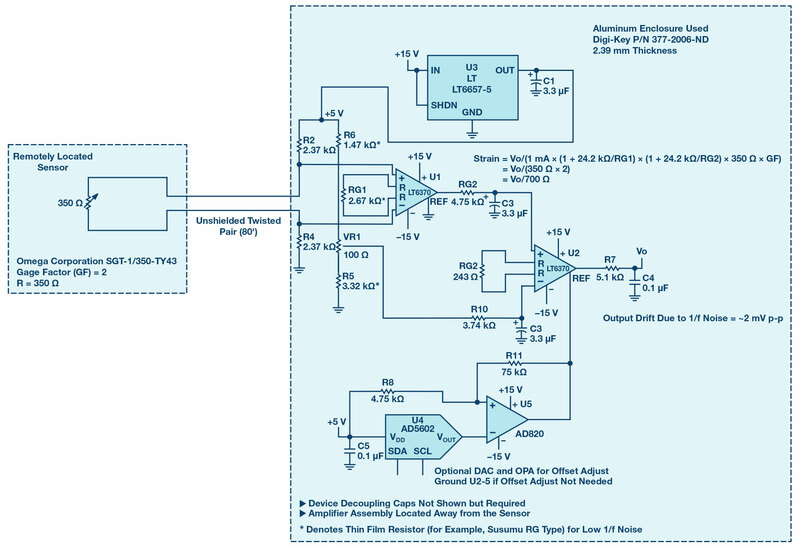 The LT6370’s exceedingly low gain error (<0.084% at G = 10 V/V) and low input offset voltage (<50 yV max specified over temperature) guarantee that U2 is presented with a true replica of the sensor voltage, minus the interference picked up by the UTP, to compare against the reference voltage developed at U2’s inverting input. The LT6657-5 creates a stable, low noise, and low drift voltage reference, immunizing the entire circuit from supply voltage variation. Of particular importance is the LT6657-5’s low 1/f noise, which can have a significant contribution due to the large gain in the circuit. With the simple RC low-pass filters (R9, C2 and R10, C3) set to roll-off at about 10 Hz on each input of U2, the output noise can be reduced by lim- iting the bandwidth. The low (<10 Hz) LT6370 1/f noise corner frequency, as shown in Figure 6, provides an advantage by reducing the impact of the 1/f noise. Furthermore, the current noise density plot shows that it is much better to keep both input impedances balanced for the lowest current noise impact by taking advantage of the correlated component of noise at the input(s). Hence the value for R10 is reduced to 3.74 kQ in order to match the R9 impedance of 4.75 kQ due to the equivalent impedance looking into the wiper of VR1. Figure 6. 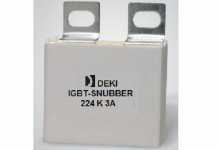 LT6370 input referred currentvoltage noise density.